Hey everyone! Happy Tuesday! Who else is dreaming of stuffing your face and not feeling bad about it in a couple days??? I know this girl is! If you have been following me for a bit, you know that I LOVE LOVE LOVE to shop at Norstrom. Not only do they have EVERYTHING under the sun, but their customer service is top notch and returns could not be easier. It's just so convenient, especially if you are an online shopper like myself! Nordstrom is currently having their Early Savings Sale and I am so excited! 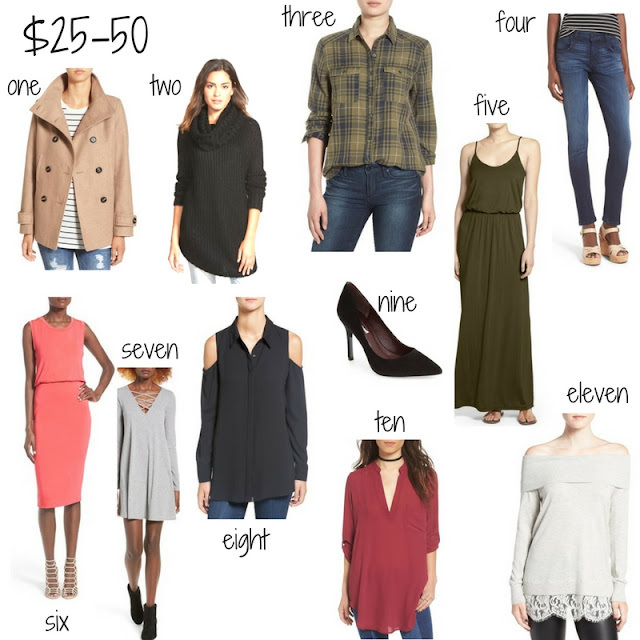 I've rounded up some of my favorites in two affordable categories! Sale items always go super fast and all these items (as of 10 pm last night) are still in stock! So let's jump right on in! HAVE IT! It comes in a ton of colors and the back is just as cute as the front! GETTING! Ponchos are so in right now and perfect to complete any look! And you can NOT beat the price of this one! WANT! Because what's better than lounging around the house in cozy socks?? HAVE! The most perfect tank for any time of year! Just throw a jacket or cardigan over it and you are good to go! Perfect and long enough to wear with leggings too! HAVE! Perfect to wear under sweaters!! GETTING! You can NOT beat the value of this jacket (less than $40) It's so classic and comes in several colors! MUST HAVE!!! HAVE! I got this last year in the hunter green color and LOVE IT! I'm so happy to see it back! WANT! Ummm, because who can have too many plaid shirts? WANT! These jeans look so cute and I love the color! For $25, who could say no? HAVE...WANT IN OLIVE GREEN! I have a couple of these maxi dresses and lived in them in the summer time. They look so cute with a denim jacket too! Super flattering! Comes in multiple colors and patterns! GETTING! Oh I LOVE LOVE this dress so much! How cute would it be with a Moto jacket! GETTING! I saw this on MakeupbyTiffanyD's recent Holiday LookBook, and I fell in LOVE! It's just so classic and would be perfect for date night! WANT! Because every girl needs a pair of classic black pumps! And you can't beat the price! I love how the heel is not to high too because this girl looks like a newborn calf trying to walk in those extra high heels! HAVE! These are the BEST y'all! They go with everything, long enough for leggings and come in a ton of colors! GETTING! Need I say more! How GORGEOUS is this sweater! Another perfect option for date night or for the upcoming holidays! Well that's it guys! I hope you enjoyed my affordable picks! There are sooooooo many great things in the sale so make sure you check it out. I hope you all have a wonderful Thanksgiving. Literally about to shop everything. Such perfect picks!! I NEED that camel coat! Definitely putting it on my holiday list! So many great pieces! How can you even choose?! Awesome roundup, girlie! Such wonderful picks!! I love how budget friendly they are. Great job love! I have one and six from the first group and they are great. Happy Thanksgiving!